For a killer-meets-stylish ensemble, try teaming a black coat with yellow skinny pants — these two items play well together. When it comes to footwear, this outfit is finished off wonderfully with Paul Andrew carpanthian slingback pumps. For a casually elegant getup, choose a burgundy tweed jacket and navy skinny pants — these items a work setting beautifully together. 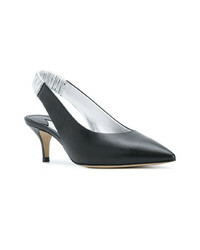 Paul Andrew carpanthian slingback pumps from farfetch.com are a smart choice to complete the look. If you're on the lookout for a casual yet totally stylish ensemble, consider pairing a black coat with blue jeans. Both garments are totally comfy and will look fabulous together. Finish off with Paul Andrew carpanthian slingback pumps from farfetch.com and off you go looking gorgeous. If you're on the lookout for a casual yet stylish outfit, pair a white blazer with white and black leopard skinny pants. Both garments are totally comfy and will look fabulous paired together. Kick up the cool of your outfit by rounding it off with black leather pumps. If you don't like trying-too-hard combinations, go for a black sleeveless blazer and brown gingham dress pants. Bump up the cool of your outfit by completing it with Paul Andrew carpanthian slingback pumps from farfetch.com. Contrary to what you might believe, looking chic doesn't take that much the place of work. Just make a beige leather trenchcoat your outfit choice and you'll look awesome. For the maximum chicness opt for a pair of Paul Andrew carpanthian slingback pumps from farfetch.com. Make a black leather skater dress your outfit choice to effortlessly deal with whatever this day throws at you. Dress up this outfit with Paul Andrew carpanthian slingback pumps from farfetch.com. If you're on the hunt for a casual yet totally chic getup, make a navy fur collar coat and navy ripped boyfriend jeans your outfit choice. Both pieces are totally comfy and will look fabulous together. Lift up your ensemble with Paul Andrew carpanthian slingback pumps from farfetch.com. This combo of a black leather biker jacket and silver sequin skinny pants is very easy to achieve and so comfortable to sport all day long as well! Sporting a pair of Paul Andrew carpanthian slingback pumps is a simple way to add extra flair to your ensemble.